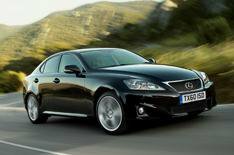 High value Lexus IS Advance arrives | What Car? Lexus has launched a new Advance trim level for its IS compact executive with far more equipment for small increases in price. The IS250 Advance is 340 more than the SE version of the car at 26,495, while the IS200d is just 130 more than its SE equivalent at 24,995. Extra equipment fitted over SE versions includes a satellite-navigation system, rear parking camera, heated and electrically adjusted front seats, front and rear parking sensors, cruise control and automatic headlights and wipers.